Food Friday Sautéed Vegetables ~ I Can Do That! End of season vegetables from my garden: green and purple sitaw, cherry tomatoes, and edamame. I sautéed them in garlic, shallots, fermented anchovies (bagoong monamon), and a little chopped crispy pork rinds (chicharrones). Simply delicious. Very fresh healthy looking menu! My first time here in your blog. That looks great. Simple and perfect for a fall day. Jay, heheh made in the US of A.
Yummy! 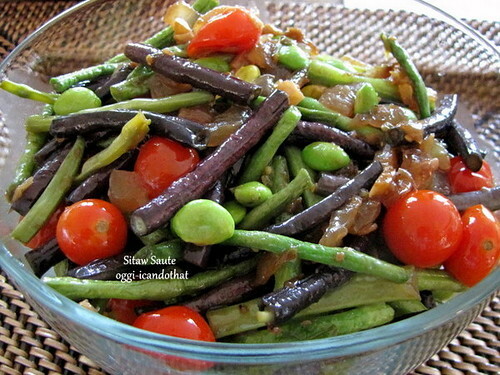 This looks great, who knew edamame and sitaw and bagoong could look so delicious!